Azalea indica ‘Pink Dream’ is one of the best pale pink varieties we have seen. The flowers a a soft pink splashed lightly with a deeper pink in the throat. Flowering from spring to early summer, with a second lighter flowering in autumn this small evergreen shrub has a number of landscaping uses. The flowers are large singles with a soft attractive texture. This is a compact growing variety reaching around 1 metre over time. Azalea indica ‘Pink Dream’ works well when used for underplanting taller shrubs and trees. Excellent when mass planted in a part shaded position and equally at home when grown in a container. Azalea indica varieties are best grown where they receive dappled, or part shade in the afternoon. In good soil, with adequate moisture and mulch they will cope with more sun in summer although we do recommend some protection in the afternoon. A humus rich soil is best, slightly acidic in pH. Dig a hole larger than the rootball of the plant, add the well rotted compost and turn the soil over to mix in the compost well. Prepare a planting hole. plant he Azalea at the same depth it was in the pot and backfill. Firm in around the plant and water in with a liquid seaweed fertiliser. Fertilise annually with a specialist Azalea fertiliser. 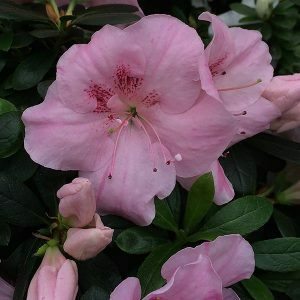 Azalea indica ‘Pink Dream’ is best when lightly pruned or clipped immediately after flowering. This help maintain a good bushy shape and better flowering the next season.